Put a celebrated auto engineer and the might of a world manufacturer together and you must get a winning car. The Ford GT40 was born from that sort of thought, as was the Ford Cobra, but it had all been done before. In 1935, genius race car constructor Harry Miller entered into a deal with Preston Tucker and the Ford Motor Company to produce 10 racing cars that would dominate the Indianapolis 500. Miller created arguably the most beautiful and advanced racing car of the day, but victory wasn’t in the cards, and Ford’s subsequent public humiliation at Indy kept the automaker out of racing for decades and nearly bankrupted Miller (though Tucker emerged unscathed). 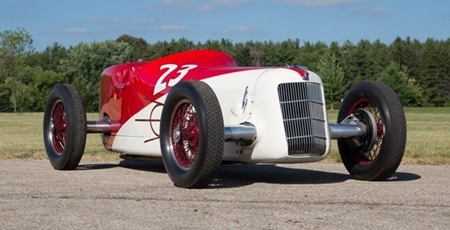 A reminder of what might have been was seen when one of the 10 Miller Ford V-8 Special Indy Cars constructed for the 1935 race crossed the auction block on Friday, August 19, at Mecum’s Monterey sale. Being so many years ago, history is somewhat clouded, but the most likely has Preston Tucker contacting Miller with the idea of creating a stock block race car in a fully modern chassis, then pitched the idea to Edsel Ford, not Henry. Even the reported source of the project’s funding differs, with some attributing it to the Ford Motor Company and others crediting a group of Ford dealers. What is certain is this: In February of 1935, a contract was signed between the Ford Motor Company and a Dearborn supplier named Miller-Tucker, Inc., to design and build a quantity of 10 race cars for the 1935 Indianapolis 500, each priced at $7,500. However, the needed equipment and parts didn’t arrive at the Miller-Tucker shop until March of 1935, giving the business the near-impossible task of designing, building and testing 10 potentially race-winning cars in less than 60 days. Miller’s design called for front-wheel drive, which he’d utilized in a 1924 racing car based upon the successful 1922 Miller 122. The Miller Fords would also debut four-wheel independent suspension, and in an early attempt at minimizing drag, would use wing-shaped cast aluminum suspension pieces and a (somewhat) streamlined body that ended in a tapered boat tail rear. The lack of a driveshaft meant the Miller Fords could be lower to the ground as well, dropping the center of gravity and enhancing stability in corners. To use a 21-stud, 220-cu.in. flathead Ford V-8 (rated at roughly 150 horsepower in race trim), Miller turned the engine and two-speed transmission 180 degrees. The layout also moved weight rearward to create a better balanced race car, and on paper, the Miller Fords had everything needed to prove competitive on the track. Working with such a compressed time frame, Miller had just hours, not days, to test his bold new design. Initially, things looked promising, but in qualifying the Miller Fords proved significantly slower than the competition, and just four of the cars qualified for the 1935 race. Had the cars occupied the front row and the start of the second row, perhaps the pressure on Miller would have been reduced, but instead the Miller Fords began the race in 26th, 27th, 29th and 33rd place, meaning that no car qualified higher than the ninth row, and one qualified dead last. The results were dreadfully embarrassing for all concerned. The top three retiring before half distance, and the last one finishing 16th. 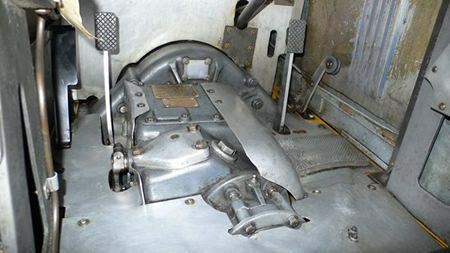 The common fault was that the steering box was located too close to the engine, and heated to the point where the grease melted and the gears expanded, locking the steering wheel in driver’s hands. In the aftermath, Henry Ford reportedly ordered all 10 race cars back to Detroit, where they remained locked away in a warehouse for the next several years. The Miller Ford auctioned was not described as having raced at Indianapolis, though it is said to be one of the 10 originally built by Harry Miller. Shown at Amelia Island in 2013 in the “Cars of Harry Miller” class, the red over white race car has been awarded an AACA Senior and Race Car Certification, and is eligible for a variety of vintage oval track events. Deputy Prime Minister Somkid Jatusripitak has brought up the concept of Thailand being a hub of Electric Vehicle (EV) production, with the Cabinet agreeing to EV promotion. This is in addition to Thailand promoting eco cars and hybrids. The EV production covers Plug-In Hybrids (PHEV and HEV), Battery Electric (BEV) and Fuel Cell EV’s. The news was not welcomed by Toyota and Honda, who said that the market in EV’s is not big enough to warrant the tooling up that would be required for EV’s. However, Mercedes are stepping up their PHEV production with the S500e and C350e models already being produced in their Thai plant. Mercedes believes that EV’s will be the “next wave” in the auto industry, with only battery charging stations slowing the acceptance by Thai drivers. In an environment full of doom and disaster, with sales figures plummeting, Mercedes are showing an 8 percent growth in passenger vehicle sales over the first six months of 2016, up to 6,504 vehicles, of which more than 1,000 have been PHEV’s. What did we learn from the German GP? Well, we learned that Nico Rosberg will never win the World Championship. We also learned that these days driving indiscretions are being recorded and telecast, and so being pinged for driving straight into another car is objective these days, not subjective! Sorry, Nico but you deserved your 5 second penalty. Not that it mattered, you were well and truly beaten anyway. Despite ‘only’ qualifying in second, the race was all Lewis Hamilton’s (Mercedes) from the second the lights went out at the start, literally coasting to the win unchallenged. At the start, the Red Bulls of Verstappen and Ricciardo were next to push Rosberg down to 4th. This was to herald a race Rosberg would like to forget. Riccciardo, on a different tyre strategy from his brash young team mate, was unchallenged after taking over 2nd and while never able to challenge Hamilton, was never challenged himself. He will take the top step of the podium in the second half of the season, but it may need Hamilton to DNF. Having a lonely race were the two Ferraris of Vettel and Raikkonen in 5th and 6th and it will take every minute of the next four weeks for Ferrari to get up to the front again. More heads will roll and an optimist will be someone who takes their lunch to work at Maranello. Last car on the same lap as the leader was the Force India of Hulkenberg who drove a well calculated race, conserving his tyres and being able to pass the Williams of Bottas with seven laps to go. There were many dices during the hour and a half race, with the McLarens of Button (8th) and Alonso (12th) generally in the middle of them, along with the Haas duo of Gutierrez (11th) and Grosjean (13th). As for the rest? Middle to rear of the pack drivers, struggling with rear of the pack cars. Make-weights and mobile chicanes or, as in the case of poor old Massa, (Williams) another bumper car. They should start Massa from the pit lane each race to try and get Felipe through the first corner without damage. After the dire threats of “track limits”, the stewards seemed to have dropped that regulation as being unworkable. The other idiocy called ‘communications’ has also been quietly dropped and we heard the dialogues between pit wall and driver once more. However, the signal is so poor, most of the transmission is impossible to understand. Despite this, I am sure that by the time the second part of the season begins, the FIA will have dreamed up more ridiculous rules to keep everyone confused. The next F1 GP is August 28 at Spa. With his confidence at an all-time low, do not put your money on NR, even though Mercedes will have expensive counselors working with Nico day and night for the next four weeks. Time for Mercedes to consider drafting in the other Nico (Hulkenberg) for 2017. They don’t even need to change the signs in the washroom. The Pattaya car club meets at Jameson’s Irish Pub on Soi AR next to Nova Park. The next meeting is on Monday August 8 at Jameson’s at 7 p.m. A totally informal meeting of like-minded souls to discuss their pet motoring (and motorcycling) loves and hates (plus lies and outright exaggerations). Come along and meet the guys who have a common interest in cars and bikes, and enjoy the Jameson’s specials, washed down with a few beers. A couple of the members are scrutineers at the Abu Dhabi Grand Prix, so they may have some scuttlebutt about the F1 scene, and one is just back from driving around Australia towing a caravan! Always a fun night. Be prepared to laugh a lot at some of the antics of the members (when they were younger)! The Car Club nights are only on the second Monday of the month (not every second Monday)! Last week I asked you to study the photograph – what is it, and who drove it? I want to know both. It was the footwell of one of Prince Bira’s ERAs. For the Automania FREE beer this week, be the first correct answer to email [email protected] or [email protected]. Good luck! Would you buy this pick-up? Get ‘em at your local 7-Eleven? For Sale – one owner for 82 years! Are you willing to pay for hybrid technology?